Did Lou Dobbs's Conservative Views Cause Him to Leave CNN? 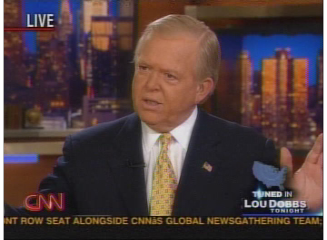 Lou Dobbs left CNN after years of tensions between him and the network's brass, who consistently objected to his outspoken, often controversial reports. But the issues that seem to have annoyed CNN execs most were ones on which Dobbs took a conservative stance. The New York Times reported Wednesday that CNN President Jonathan Klein offered Dobbs an ultimatum a few months ago: "Mr. Dobbs could vent his opinions on radio and anchor an objective newscast on television, or he could leave CNN." Klein reportedly complained about Dobbs's reporting on the Birther movement over the summer, and his outspoken opposition to illegal immigration. According to the New York Post, one "TV insider" said Dobbs was "polluting the CNN brand" of purported political objectivity. Klein issued a statement saying Dobbs had decided to "carry the banner of advocacy journalism elsewhere." Dobbs held liberal sentiments on a number of issues, but these did not spark the controversy and CNN infighting that his conservative views did. In discussing why Dobbs would leave CNN, media commentators note that CNN is trying to position itself as the non-opinionated network, and Dobbs did not fit the mold. But pundits cite only his conservative views in discussing tensions with the higher-ups at the network. Neither of the aforementioned articles from the Times and the Post mention Dobbs's liberal views. We can talk about national health care, universal health care coverage call it what you want to, but this country has a responsibility to all the people in this room and Americans, all but the very poor and the very rich, are the ones being hammered because there is no program for the middle-class. Dobbs, in a stunning show of liberalism, faulted capitalism with problems in the health care sector. "[T]he federal government is saying we’ve got to have these laissez-faire capitalist policies because we want to be competitive," he lamented. Dobbs attributed high health care prices to increases in outsourcing. The idea that corporate America can continue the business practice of outsourcing jobs, good paying American jobs, overseas to cheap labor markets, many times offsetting a job that pays $15 to $20 an hour, perhaps more, and replaces it with a job overseas paying about $0.42 an hour, let’s say, for example, I don’t know what it’s going to take for corporate America to find a conscience. Health care and employment are both high-profile national issues, and Dobbs touted the liberal line on both, making some controversial statements on the issues. CNN claims that it is trying to take a "middle of the road" approach to reporting, replacing Dobbs with veteran Washington correspondent John King. Objections to Dobbs's reporting from CNN's corporate officers only seemed to come in response to his conservative views.